Air Control Industries will be exhibiting its latest range of drying systems for the craft brewers market at the 2018 Craft Brewers Conference. The company has more than 40 years of drying bottle and can experience and has dedicated systems to offer breweries using line speeds in both the hundreds and in the thousands per hour. ACI range of innovative drying solutions reduce energy usage by as much as 90 percent when compared to compressed air, fully eliminate water carry over and are easy to install, operate and service. CFT Group designs and manufactures machineries and complete turnkey lines for the food, liquid food and beverage industries. At CFT Group’s Booth 1500 you can see its brand new 20-HL brewhouse FIRSTBREW (also available in 10 HL). A very compact solution integrating CFT Group’s premium processing technology and specifically engineered for micro breweries’ specific requirements. CFT will also unveil its new compact Rotary Filler and Seamer Monoblock, specifically designed for small plants. With its 10 filling valves, MICROBREW offers you a concentrate of performance with a filling speed of 100 centimeters per minute. This year, you will also have the opportunity to discover CFT Group’s partner’s machines portfolio: German-based company ROLEC Craft Brewery Systems. The XpressFill XF4500 four-spout counter-pressure filler provides the most sophistication and at the same time the greatest simplicity available in this price range. This unit sells for $6,295 with an estimated production capacity of 400 12-oz bottles per hour. The enclosed stainless steel system is ready to fill out of the box; no assembly is required. The closed system maintains a higher bottling pressure and eliminates wasted product and allows for a CO2 purge prior to the fill. See XpressFill equipment at the More Beer Booth 728. 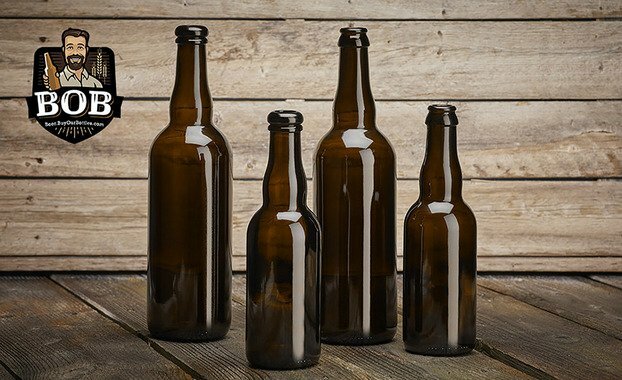 Ardagh Group will showcase its classy, new 375-ml Belgian Crown and 375-ml Belgian Cork bottles at the 2018 Craft Brewers Conference in booth 1244. Complementing Ardagh Group’s 750-ml Belgian Crown and 750-ml Belgian Cork bottles, the 375-ml Belgians were developed as the result of a bottle design contest conducted at the 2017 Craft Brewers Conference. The bottles are available for purchase on Ardagh Group’s BOBTM site. Ardagh Group is dedicated to the craft beer market with capabilities and resources to grow with craft brewers every stage of the way. For brewers interested in purchasing bottles by the pallet, the BOB platform offers convenient online ordering and payment via credit card or PayPal. Petainer has unveiled its new petainerKeg Hybrid as part of its global keg family of products. The one-way Hybrid keg offers universal filling, excellent handling, safety and sustainability benefits. Petainer’s team of scientists and technical experts have worked closely with partners such as KHS, the global leader in keg filling equipment, and customers to ensure the keg design meets the exacting needs of users across the drinks industry — from beer, wine and cider to cold brew coffee and kombucha. PetainerKeg Hybrid has a lower total cost of ownership than other packaging formats such as steel and glass, because it can be filled, sent and recycled when it is empty, cutting out costly return logistics and washing processes. In addition, only minimal investment or adjustments to filling lines are required because the keg has been designed to be filled using existing equipment, whether it is manually or on semi and fully automatic lines. The keg can also be sold as a kit and then blown and assembled at the filling plant in the local market, providing cost-efficiencies and helping to improve profits for larger breweries producing high volumes of draught beer. Like other products in the petainerKeg range, Hybrid can be used with universal coupling systems, with flat fittings compatible with Micro Matic A and G systems and well-type fittings compatible with Micro Matic S and D systems, so customers know their product can be dispensed anywhere in the world. Once empty, the keg is easier to depressurise and disassemble than other PET kegs — the chimes simply unclip from the keg body so that all parts can be recycled as part of the waste stream.